Jolie Kerr is a cleaning expert and advice columnist. She’ll be here every other week helping to answer your filthiest questions. Are you dirty? Check the Squalor Archive for assistance. Are you still dirty? Email her. I have a problem. I insist on using those excellent fabric shower curtain liners in my shower, because the home shower is a Special Place and deserves to be treated as such. So, the problem: The side of the fabric liner closer to the shower head/faucet tends to get mildew-y and gross along the bottom. (Note that this doesn’t happen anywhere near as much on the other side.) I’m devoted to those fabric liners, but I have had trouble washing them in the past, because they seem to immediately lose their waterproofing in the wash. So when I hang them back up, they’re more “fabric” than “liner”—meaning I have to trash them when they get mildew-y and Amazon a new one. So what can I do here? We’re going to talk today about the ways in which you might go about cleaning a shower curtain liner that’s developed mold, mildew, assorted other bacteria, and soap scum. There are a couple of easy and pretty straightforward ways to do so, but before we do that, there’s an important thing to address: The why of why you’d clean a shower curtain liner rather than just throwing it away and hanging up a replacement. I have no data on this practice, but if I were to guess, I would say that most people opt to simply replace a moldy shower curtain liner with a new one. They’re inexpensive and can be purchased at drug stores or grocery stores or on Amazon in a snap. Right? Right. However, most shower curtain liners can’t be recycled, which means that vast swaths of mildewed plastic or vinyl end up in our landfills. That may not move you at all, which is why it should also be noted that cleaning a liner is cheaper than replacing it. We might only be talking about a difference of a few bucks, but why not save those few bucks and put them toward the purchase of something more exciting, like a new Chapstick or a liter of cola? Shower curtain liners come in a variety of materials, but for today’s purposes, we’ll stick with the three most common types: plastic, vinyl, and fabric. While all three types can be machine- or hand-washed, the advantage of plastic and vinyl liners is that they can also be spot-treated while they’re hanging around on the rod. 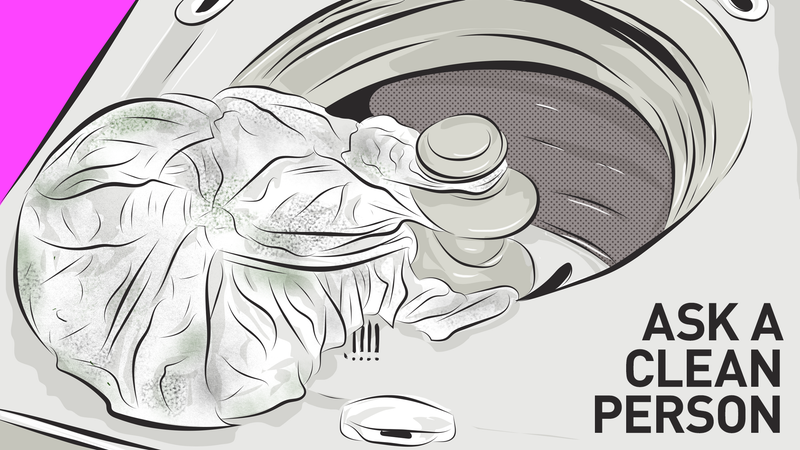 In terms of fabric liners that seem to lose their waterproofing after being laundered, the most likely explanation is that it’s a brand-specific problem, since, like, the whole point of getting the fabric kind is that it’s so easily machine-washed. (I suppose there are other points to be made in favor of buying a fabric liner. The smell issue is a big one for a lot of people, so.) Blessedly, Amazon allows us to sort products by bestseller within terrifically niche categories like “shower curtain liner,” which means that you can pretty quickly scan reviews of the top-selling brands to see which ones hold up best after washing. Use cold water and the gentle cycle if that option is available to you, a small amount of regular detergent, and a laundry booster of some sort that will eliminate the buildup of mold, mildew, and soap scum. Some good options are: bleach (1 tablespoon), white vinegar (½ cup), Borax (¼ cup), and OxiClean (¼ cup). Just choose one—they’ll all work just fine. To dry, simply shake the liner off when you take it out of the machine—the final spin cycle will wick away most of the water, so there should only be a small amount of beading left behind — and rehang it on the curtain rod to finish air-drying. That’s all! If you do your washing outside your home, either in the basement of your building or at a laundromat, you may want to bring a small towel or rag to wipe the liner off to make carrying it back home a touch less drippy, but that’s not required. If you have a top-loading machine with a center agitator, which are the type that looks like this, things are going to be a little bit trickier for you. First, you should be prepared for the sad but likely outcome that the liner will get shredded in the wash. There are precautions you can and should take to avoid this, but even so, the center agitator is no friend to a shower curtain liner. The instructions for washing a liner in a top-loading machine are the same, with the addition of some towels to provide a buffer between the thin liner and the center agitator’s fins. Many people choose to launder cleaning rags along with the shower curtain liner—the theory being that these are all rather funky items in need of cleaning that can go in a load together to be ridded of their funk. As you load the machine, do your best to put the towels or rags around the agitator and place the liner on the outer edge of the drum. You may, however, opt to skip machine-laundering if you’ve got a top-loader and just go for spot-treating. The idea here is that you’re going to spray some sort of mildew- and mold-eliminating cleaner like white vinegar, Tilex, bleach solution, X-14, or what have you along the bottom and outer edges of the liner where mold has developed. Then, using a damp sponge, scrub at those areas. A sponge with a scrubber-back or something like a Dobie Pad is a good choice, but a plain old sponge or even a rag will work just fine, too. Once you’ve scrubbed away the mold, rinse your sponge out well and go over the liner again to remove any residual cleaner. That’s all! Regardless of which product you use, I would strongly suggest wearing a pair of rubber gloves for this job—even if you use vinegar, which can make contact with your skin without causing irritation in the way that bleach or my beloved X-14 will, you’ll be happy for the gloves, because having to grab a damp, mildew-y shower curtain liner with your bare hands is iiiiiiiiiiiicky. And you’ll probably have to do some unfolding and peeling apart of particularly grotty sections of the liner that have folded back on itself. So: Wear the gloves. You’ll be glad you did. Jolie Kerr is Deadspin’s resident cleaning expert and the author of the book My Boyfriend Barfed in My Handbag … And Other Things You Can’t Ask Martha (Plume). Follow her onTwitter, or email her: jolie@deadspin.com.